In his latest Super 6 Class of '92 diary, Ryan Giggs pays tribute to former coach Eric Harrison, looks at old pal Paul Scholes' start at Oldham, Ole Gunnar Solskjaer's first setback, and what next in the title race. He worked with young Mark Hughes, Lee Martin and Mark Robbins who went on to play for the United first team, but obviously the youth team of 92 owe a lot to Eric Harrison because he was a mentor to all of us from very early on from the age of 13 or 14. He had a huge impact on all our careers. I've seen players with real ability not go on to make it, but what Eric did to get the best out of us was test us, he took us out of our comfort zone, and you never felt like you'd 'made it'. A lot has been made of how tough he was, but he also always wanted to play great attacking football in the spirit of United. Not only did he toughen us up, but he taught us how to make the most out of the ability we had. It's getting less and less likely that there will be another group of players who can come through at a club together like we did, but I'm not saying it's impossible. I think if a group of players like us back then were on a lot more money I don't think that would bother Eric, he'd push us even harder. It's a shame because Eric was tough, but he gave us a great grounding; we could do with a few more coaches like him around. He always wanted the best for us. If you were down or injured or out of form he was always there for you to lift you up, so there was that side to him as well. They certainly don't make a lot of coaches like Eric. A great first win for Paul at Oldham. I remember the same thing happened to me when I won my first Wales game 6-0. 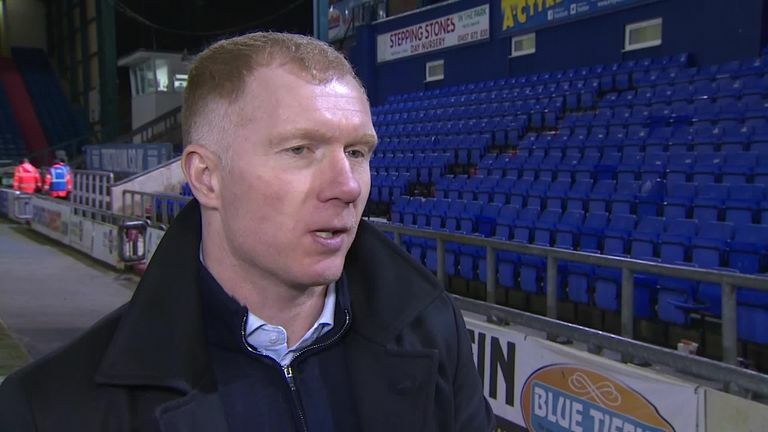 It's obviously great to get off to a good start, especially now the expectation at Oldham will be higher than usual, but Scholesy knows that and he'll be working even harder. It was great for him and I'm delighted but he's been in football long enough to not take anything for granted. That start will only make him work harder if anything. It's been well documented that he wanted to get into management and with Oldham being local and a club he's watched regularly we were all aware of that. It was just a matter of time until it did happen. Like everyone else, we're interested to see how he gets on and we're taking a keen interest in how he does. He's a really good football person, obviously. Manchester United have been brilliant since Ole took over but we all knew what United are, they were in a false position in the league before he took over but they're still a few players short of challenging in the Champions League year after year. But the signs have been promising so it's just a case of not getting too cocky when United were winning, but not getting too downhearted after losing to PSG. They had to lose at some point! There are some big games coming up for the club to bounce back in; tough games against Chelsea and then Liverpool, probably the biggest game for United fans. But they're good games to have after a defeat as you don't need any help to get the players up for them. This is where the experienced players and the manager are really important. You've got to forget about all the noise from the media and the fans putting pressure on and saying: "If you lose a game the title race is over." There are going to be twists and turns all the way to the end of the season I think. If you're beaten you've got to bounce back, and if you're winning games you can't take anything for granted. It's hard, especially with social media now, but you've got to block out the noise. I think City's tails are up at the moment, but it can soon change. Injury-wise, City are a bit better off right now and injuries are the one thing that can kill you in a title race. You can have momentum, but if you're picking up knocks and players are missing eventually it will catch up with you. If you're a team that more or less has a full squad gong out every week then you're in a much better place. You're overriding emotion after winning the first one wasn't celebration, it was relief, having not won it for so long to finally win one was just a relief. For the pundits and the neutrals, they all want it to go down to the wire but as a player there's nothing better than winning it with a couple of weeks to go so you can enjoy it, because when you win it on the last day it's only after that last game you can enjoy it. Otherwise it's just sheer relief. It's one of those runs that we've been on since before Christmas really, we've had a couple of good wins and then a couple of cup games that have just killed the momentum a little bit. We definitely need to get back to winning ways because we're running out of games. At this time of the season any team that can go on a run and can grab the momentum. We've had a couple of injuries in midfield, but we've made a couple of signings and we're getting players back, so hopefully we can kick on from here.